Early styles of drum set playing greatly differ from a lot of the groove-driven approaches used today. Cymbals acted almost secondary to the kick and snare drums of primitive kits. Before the ride cymbal and hihats, drummers would routinely establish time by "feathering" the kick on all 4 beats of a measure and using short buzz rolls on the snare on counts 2 and 4. A small cymbal mounted to the rim of the bass drum, known as a clanger, behaved as an ancestor to the hihats, but didn't serve as a primary timekeeper. Various contraptions, like Ludwig's Snowshoe pedal (pictured left below), came and went before the development of the low-boy pedal. The low-boy (pictured right below), or low-sock, strongly resembles modern hihat hardware, except it stood about only one foot from the ground. Drummers didn't typically strike the low-boy cymbals with a stick since the cymbals sat so far beneath them. They instead operated the pedal with one of their feet to create the familiar "chick" sound. While nobody knows exactly who invented the modern hihat stand, one specific drummer mastered its delicate art long before anyone else. During the late 1920s, the legendary "Papa" Jo Jones (pictured left below) began playing timekeeping patterns on what would be later known as the hihats. 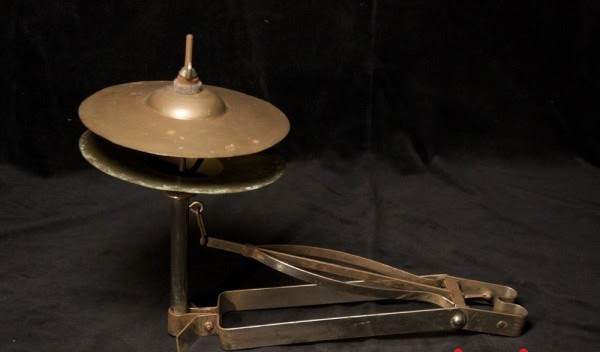 Some speculate that Barney Walberg, of the famous Walberg and Auge Drum Company, invented the earliest hihat stand in 1926. 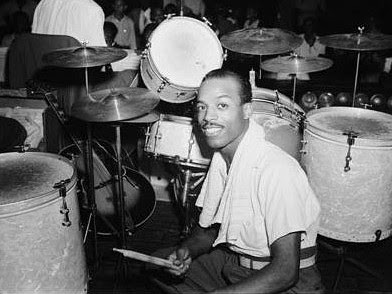 But others, including the equally legendary "Philly" Jo Jones (no relation to "Papa" Jo Jones), attributed the creation of the modern hihat stand to early jazz drummer William "O'Neill" Spencer. Regardless, the now-raised cymbals allowed drummers to strike them with sticks, creating an entirely new realm of sound possibilities. With the creation of spring-loaded bass drum pedals just 20 years earlier, the drum set finally began taking a form more recognizable to modern drummers. How Do Drummers Use Hihats Today? Today, some drummers use multiple hihat stands on a single drum set. Remote pedals (pictured right above) allow drummers to have hihats positioned separately from the pedal, enabling flexible placement. Drummers that frequently use double kick pedals may find a second hihat stand useful -- one regular stand with a foot pedal for typical hihat use, and another stand to hold a pair of hihats that stays closed. As music evolves, so does the drum set. Drummers will certainly modify existing hihat hardware as the need arises to adapt to the ever-changing demands of new styles of music. Want to learn more about hihats? Contact the expert drum instructors at Boston Drum Lessons. We're always happy to chat about different types of drums with our students.